China's consumer price index (CPI), a major measure estimating inflation, rose by 0.6 percent in November, the first year-on-year rise in consumer prices since January, according to the National Bureau of Statistics (NBS) data released on Friday. Though the NBS said the country was not facing inflationary pressure, analysts feared the continually rising consumer prices could make controlling inflation a challenging task next year, when the CPI could cross 3 percent. 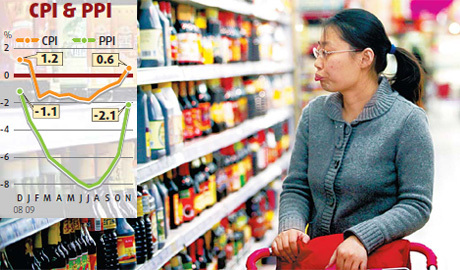 NBS spokesman Sheng Laiyun said rising food prices and the energy price reform have contributed to the CPI rise. To save energy and protect the environment, the government has raised the prices of fuel and the charges for electricity and water supply to better reflect market demand. Early snow in northern and central China, which harmed agricultural production and transportation, also contributed to the rise in food prices. In the last week of November, for example, vegetable prices rose 31.8 percent from the previous month. Moreover, compared with last year, the price of crude oil has almost doubled, driving up China's domestic fuel prices and contributing to the recent price rises, said Matthew Circosta, an economist with Moody's Economy.com. And the spiraling effect of the jump in oil prices, which add indirectly to freight and packaging costs, has pushed up prices of agricultural products. The rising prices, especially of food, have aroused worries among ordinary people. A woman taxi driver, surnamed Guo, who lives in northern Beijing, said rising prices of food items such as vegetables, meat and rice had forced her to cut her spending to make ends meet. Analysts said inflation could keep rising because the government had decided to continue its pro-growth policies. "With the economy continuing to grow strongly, the overall demand and money supply both would remain strong, which would push up inflation further," said Dong Xian'an, chief economist of Industrial Securities. And the CPI could rise above 3 percent next year. "Demand side price pressures are gathering momentum," Circosta said. Despite moderating on year-on-year terms last month, the retail sector remains robust as NBS statistics show China's retail sales in November grew by 15.8 percent year-on-year. "With fiscal stimulus still to work through the economy, firming up domestic demand would boost retail sales, putting upward pressure on inflation," Circosta said. Though there is no sign of the central bank raising the interest rates soon, inflation is building up and may signal the need for tightening the rates some time next year. While the Central Economic Work Conference, which concluded on Monday, decided to continue its "moderately loose" monetary policy and pro-consumption strategy, it also said policies would be made more flexible, which analysts saw as a sign of leaving a leeway for possible tightening. The NBS said the November industrial output for China, which gauges activity in factories and workshops, increased 19.2 percent year-on-year, up from 16.1 percent in October. Fixed-asset investment in urban areas rose 32.1 percent in the January-November period after growing 33.1 percent in the first 10 months of the year. The central bank, the People's Bank of China, said on Friday that new yuan lending rose to 294.8 billion yuan in November, totaling 9.21 trillion yuan ($1.35 trillion) in the first 11 months, compared with 4.15 trillion yuan for the same period last year. The country's fiscal revenues in November rose 32.6 percent year-on-year to 502.9 billion yuan, the Ministry of Finance said. It was up from October's year-on-year percentage of 28.4. In the first 11 months of this year, fiscal revenues rose 9.2 percent year-on-year. We know CO2 is a direction conductor for heat. It can preserve heat from giving out, and can be used as thermal insulation materials.